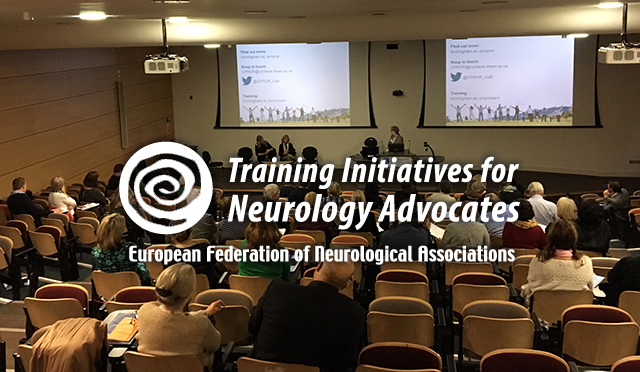 In 2016, EFNA launched its Training Initiatives for Neurology Advocates [TINA]. For many years EFNA has run workshops on Health Technology Assessment and, lately, Pharmaceutical Policy – Pricing, Access and Reimbursement at the London School of Economics. However, feedback from participants indicates that patients now need to be equipped to use the theoretical knowledge gained on these processes, and the wider research and development cycle, in a more practical way. For example, through the development of communication, advocacy and campaigning skills and the generation of patient evidence or patient reported outcomes. Also, EFNA is also eager to ensure that our training activities are targeted to the neurology sector and the specific obstacles faced therein. Working with other stakeholders in the field e.g. neuroscientists, neurologists, industry, regulators and payers is also part of our envisaged way forward. This approach has led to the launch of TINA in autumn-winter 2016, with three events across Europe tackling the issues mentioned above, from both a national and pan-European perspective. Introduction to Neuroscience: What do Patients Need to Know? How do we value care vs. How should we value care? Utrecht – Saturday, November 6th – download the agenda (English) here. This initiative has been made possible through unrestricted educational grants from the below sponsors, who have had no direct influence over the final agenda – including the selection of topics, speakers, case-studies, etc. The objective of this meeting is to upksill neurology patient advocates to participate in the R&D process and beyond – and the outcomes will be disseminated in an appropriate manner to allow for this objective to be met. Thanks to Merck Serono, MSD, Novartis, Sanofi-Genzyme, Teva, and UCB.